"The City of New Orleans," which apparently means some bureaucrat who convinced the police department, the fire department, and parks and parkways, has decided to end a century old tradition in my neighborhood. Every year people take their Christmas trees on December 31st to the neutral ground on the 4200 block of Orleans Avenue. Then at nightfall, there is a massive celebration with a giant bonfire and fireworks. They argue that they are shutting this down for the safety of our persons and our homes. To the best of my knowledge, nobody has ever gotten hurt during this tradition, and no home has even come close to catching on fire. In the past there have always been police and a fire truck standing ready in case there were problems. With only a few firemen and police required, this strikes me as a very limited drain of city resources. Instead of focusing on this event, why not try to ticket the hundreds of people who shoot firearms in the air on New Years? Or spend some time doing police work so we don't have to live in the murder capital of the world. 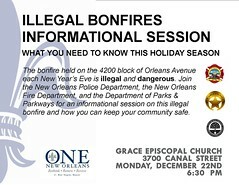 The Mid-City Neighborhood Organization asked if there was anyway to get a permit to hold the bonfire, and they were told no. I plan on writing to my City Council representatives, and voicing my disapproval at the Dec 22 meeting. People who live here are going to fight when outsiders try to take away these cultural events. We don't want to live in anytown U.S.A. New Orleans has unique traditions that need to be defended. Here is a video we made of our family at the bonfire two years ago. It's one of our favorite things to do in New Orleans. Check out Save the Bonfire. Maybe we just spread the world to go somewhere else. I think the big field across from ProTech on N. St. Patrick would make a nice spot for a flash mob bonefire.